"Most of the proliferated small arms in the country came from Libya through the sub-Saharan route." 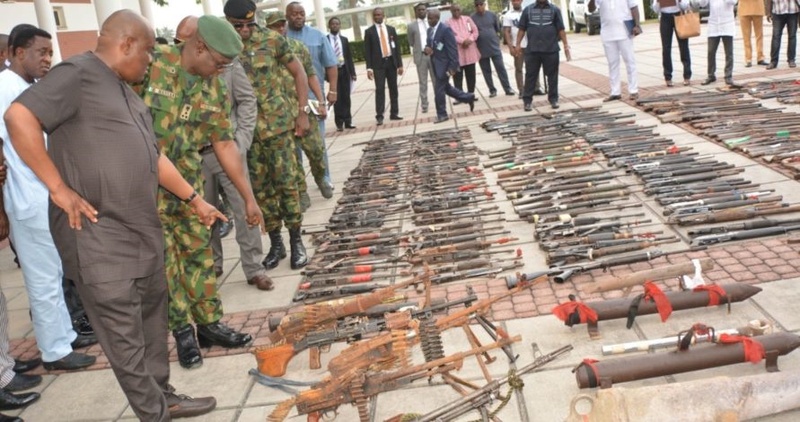 The Minister of Defence, Mansur Dan Alli, says the Federal Government will soon set up a commission to mop up small arms and address the menace of light arms proliferation in the country. The minister disclosed this on Monday in Gusau at a special town hall meeting on Federal Government measures to curb killings through cattle rustling in Zamfara. The Minister of Information and Culture, Lai Mohammed, led five ministers to Gusau for the special town hall meeting. Apart from Alli, other ministers are Water Resources, Suleiman Adamu; Ministers of State, Environment, Usman Jibrin; Budget and National Planning, Hajia Zainab Ahmed and Industry, Trade and Investment, Hajia Aisha Abubakar. Alli said that the new commission under the office of the National Security Adviser would be charged with the responsibility of mopping up small arms, among others. He said most of the proliferated small arms in the country came from Libya through the sub-Saharan route. The minister said that Nigeria had over 3,000 forests, most of which were used for arms trafficking and were enormous for military and security control.